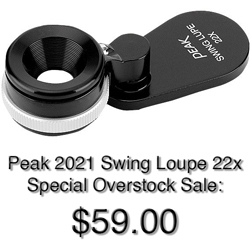 Peak Puncher and Holder is a convenient accessory to be fitted to Loupe 8X is used for viewing and checking 35 mm developed film and color slides. It is a non-efficient and troublesome operation to determine the quality of a long roll film by visual inspection and to affix marks using magic ink or scissors, but if you use Loupe 8X equipped with this puncher and holder, you can depress the puncher and give a V-shaped cut to the film perforation, while you are viewing the film, thereby completing the marking operation correctly and quickly. Fit its surface, on which a pushbutton for marking is mounted in a slanted state, to the bottom of the Loupe 8X, and you will be able to view and check a roll film, fit its reverse side, which has grooves for inserting a slide mount, to the bottom of the Loupe 8X, and you will be able to view and check the slide. The Light Box is a new item with an auxiliary lighting source to be used where the supply of light is not sufficient when you use the Loupe 8X with Puncher & Holder or Microfilm Viewers (2026, 15X and 20X), and Hand Viewer 8X (item 2026). (Two kinds of white diffusing plastics are used for the light box). The plastic with a hole in the center is for No. 2018-SET and the one without hole is for No. 2026 series. When you want to use the light box for No. 2018-SET, please refer to the pamphlet of 2018 series. 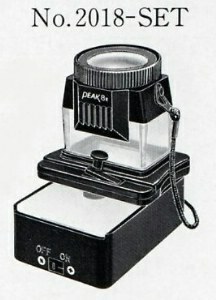 It is very simple and easy to connect the Light Box to the Microfilm Viewers. A small rectangular metal plate is enclosed for the purpose of the connection. Put the small metal plate with a paper cover upward horizontally just on the magnet of Light Box. Then, peel the paper cover from it and fit the Microfilm Viewer, sliding it into the inner side along the both guides, on the white diffusing plastics until it stops at the end. Press the Viewer down from above so that metal plate with adhesive on the surface will stick to the bottom of the Viewer. Now, you can use the Light Box properly. When you like to detach the Microfilm Viewer from the light box, just lift it up with light box holding in your hand. The set consists of the 8x Magnifier (2018), Punch (2018-PH) and Light Box (2046).